NEW YORK--(BUSINESS WIRE)--a4, the cross-screen targeted advertising company launched by Altice USA, has simplified the media planning process by introducing its next generation platform, Athena. Athena by a4 was designed to help agencies and brands rapidly build targeted, audience-based media-plans and execute them from a single, easy-to-use platform. It improves on a4’s Total Audience Platform (TAPP), which has fueled thousands of TV campaigns saving an average of 65% off of incumbent plans since its inception in 2015. Athena uses the same robust audience data set across both TV and digital to analyze consumption patterns and determine optimal placement between screens. 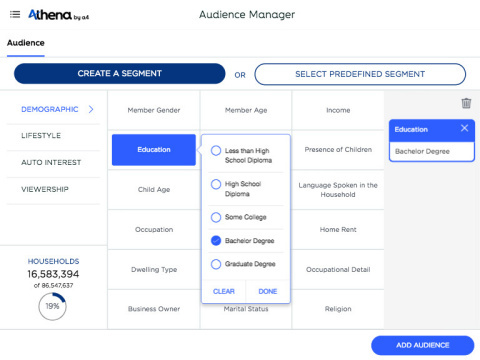 Audience sets become more granular, leveraging TV viewership data and custom onboarded CRM files to enable a new level of precision in planning. A4 – and their clients who are piloting Athena – are expecting even better cost efficiency, better integration between traditionally siloed media plans and faster speed to market. With Athena, TV and digital plans become integrated and choreographed so they can reach a defined audience in the most powerful way possible. To better target mobile users with geo-fencing and geo-targeting through Athena, a4 has also acquired Zapp360 and its Ad Messenger™ platform, which it has been employing since April 2018. This tech engine has a unique understanding of how to effectively deliver mobile ad messaging to local audiences. a4 is a brand of Altice USA and the company’s advanced advertising and data business, which provides audience-based, multiscreen advertising solutions to local, regional and national businesses and advertising clients. a4 enables advertisers to reach more than 90 million U.S. households on television through cable networks, on-demand and addressable inventory across the U.S., and more than 45 million U.S. households through authenticated, privacy-compliant IP addressability supported by rich data sets and powerful analytics and attribution services in a simple, user-friendly way.